Our community is our extended family. up and make it a wonderful place to be. Thank goodness for True Juice! It has saved our hungry stomachs many times since its opening. A mere three blocks from our office, we can stop by in a pinch to grab an organic juice or smoothie, or something to eat off the menu. We are so thankful to have an option like True Juice that shares the same standards of food integrity--everything is organic and never genetically modified, ever. You can go into True Juice safe from concern about food quality, and instead save all of your attention for their welcoming environment and sweet staff. Aquarius is our favorite place in Grants Pass to peruse the shelves, looking for a treasure we never knew we needed. The owners, Fred and Scott, have created a wonderful and inviting environment to display their wares. 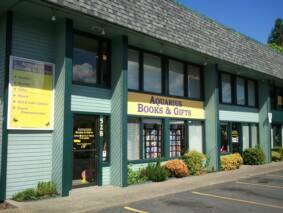 More than a gift shop, Aquarius shares positivity and light with the town of Grants Pass. 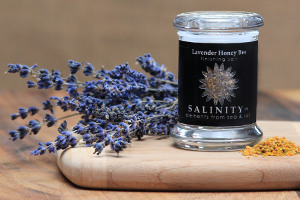 We love salt, and we love no salt more than we love Salinity's finishing salts. We are guilty of eating them straight out of the jar, as you will be the moment you try one! Check out Salinity's webpage and see how many delicious blends the local owners, Jody and Laine, have created. Yum! Local author and Physical Therapist, Doranne Long has created this outstanding guide to managing pain and other physical ailments. Your Body Book is a very thorough but easy-to-use guide to taking care of your structural health-- an invaluable guide written by an extraordinarily knowledgeable and compassionate woman! Please visit yourbodybook.com for more information. Uber Herbal's Tea and Toast Bar is a short walk from Radiant Family (lucky us!). Not only is Uber a great place to stop in for a healthy organic snack, but Elizabeth's magical teas, spice blends and other farm-fresh concoctions are also available online here. This is also, hands-down, one of our favorite local shops to peruse when we want to get a local gift. Restoration Beauty is a real gift to Grants Pass. It is difficult to find a low-chemical salon that uses organic products anywhere, but we have one right here in Grants Pass! Aside from the amazing products, and great benefit to our health by avoiding exposure to unnecessary chemicals, Rachel is a talented stylist. She has also created a lovely little oasis of calm and relaxation in her shop in downtown Grants Pass, a short walk from Radiant Family. Learn more about Restoration Beauty and what Rachel has to offer by clicking here. Rogue Coffee Roasters is our second favorite place in Grants Pass to hang out, following Radiant Family of course. Rogue not only serves and sells wonderful coffee, but the staff are a team of incredible folks that make us look forward to every visit. Spending time in Rogue Coffee always leaves us feeling thankful for the great community we have here in town. 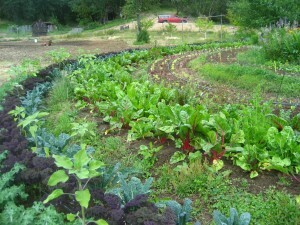 We are so lucky to have an abundance of small farms locally. One of our very most favorites, and very local, is Sweet Water Farm. We look forward to seeing Sam and Denise's organically-grown edible treasures every Saturday at the weekend market. Sweet Water also offers a great CSA (Community-Supported Agriculture) program that ensures you weekly produce shares over the growing season- a great way be healthy is to eat that way, and the best health starts with the best quality foods! As health and health education is our greatest method of contributing to our community, we value the important work of GMO Free Josephine County. This group of concerned citizens gives their time to educate the public, to serve and support the local farming community and to defend the rights of the public. Please visit their website to learn more, and consider joining in their bi-monthly general meetings.